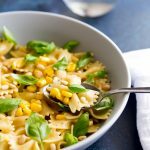 This Summer Pasta with Sweet Corn and Basil is a fresh and quick pasta dish that is perfect for the warmer weather. 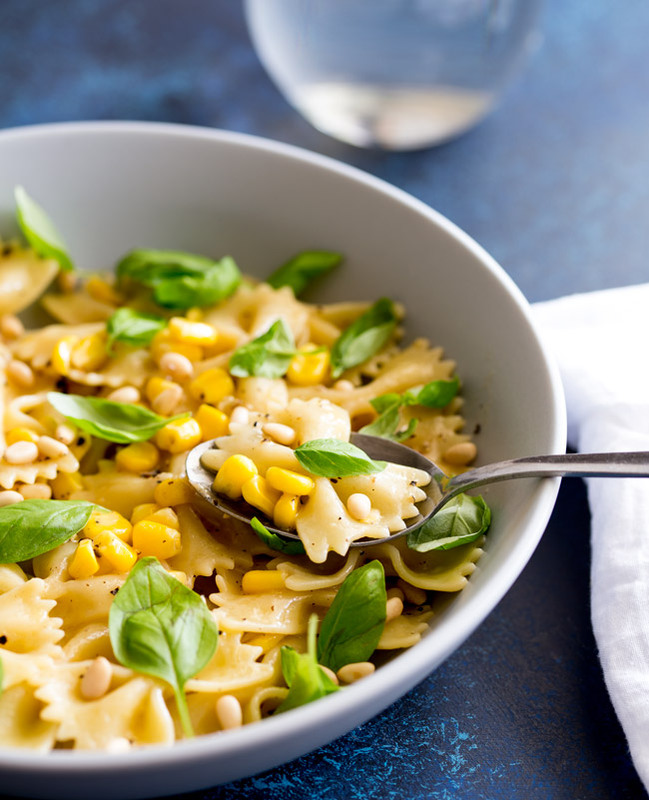 The pasta is coated in butter and black pepper then tossed through sweet corn and fragrant basil. Finished with creamy and crunchy pine nuts. Just 5 ingredients that sing together and make a dish that will quickly become a firm family favourite. The key to this dish is the butter and pasta water emulsion that coats the pasta. Using some of the cooking water from the pasta is a key tip for so many pasta dishes. The starchy water helps to emulsify sauces. It gives you the chance to use less cream, or in this case less butter, and still achieve a glossy and unctuous sauce. Use salted butter, as this helps to pack even more flavour into the simple sauce. The beauty of this dish is the corn is just warmed through so you can easily use frozen corn if fresh corn isn’t available. I wouldn’t recommend canned corn as it can be a little soft. With the basil you want to just lightly tear it up, don’t cut them with a knife or the leaves will bruise and get black edges. If you have baby basil leaves then just leave them whole. 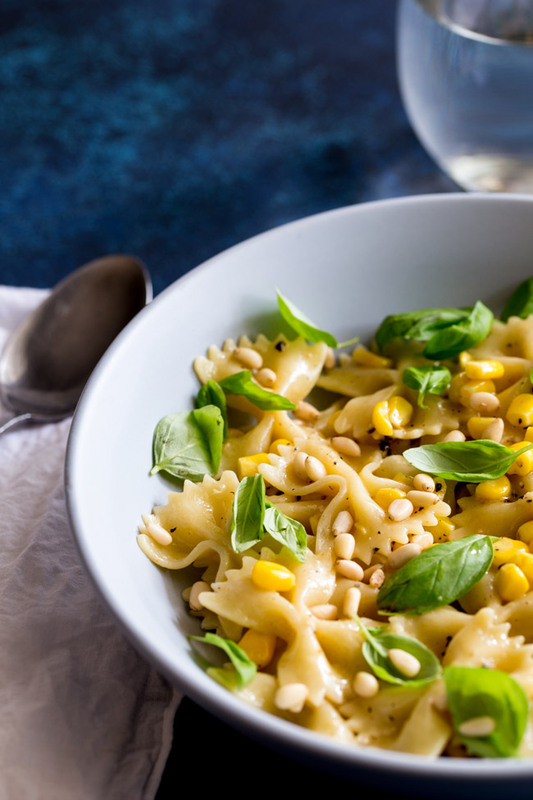 Side: To balance the sweet corn and rich butter serve this pasta with a rocket and parmesan salad with a drizzle of balsamic dressing. Wine: The basil in this dish needs to be paired with a herbaceous wines like a Sauvignon Blanc, which will also work with the buttery sauce. This dish lends itself more towards white wine, but a very light young pinot noir could work. 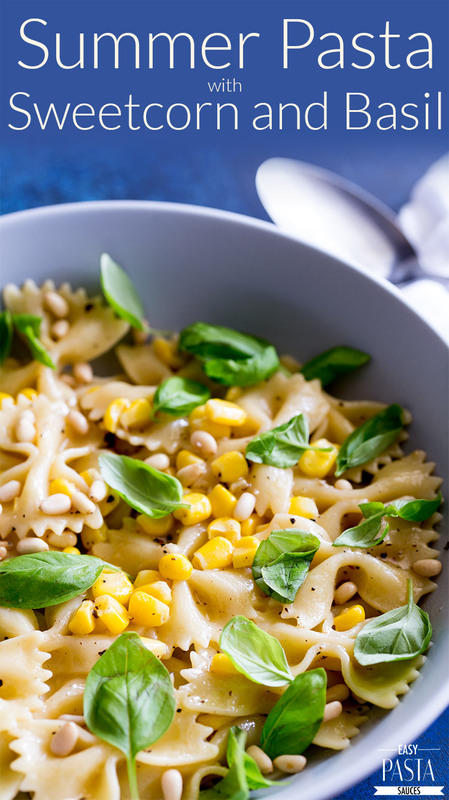 Want to save this Summer Pasta with Sweet Corn and Basil for later? Pin it here. Bring a large pan of water to boil and then add a generous amount of salt. Put the empty pan back over a medium heat and add in the butter and black pepper. Add in 1/3 cup of the pasta water and stir well until you have a thick glossy emulsion. Add the corn and the drained pasta. Then stir gently to coat. Remove from the heat and stir through the basil. There’s something about sweet corn that just screams summertime. Love this recipe! I agree Lisa, it is just so sweet and fresh. Looks like a good reason to stock up on pine nuts. Totally need to remember to save the pasta water! Definitely Matt, the pasta water makes the sauce! This looks delicious and that fresh basil looks like the perfect addition to this summer pasta. I cannot wait to try this! Thank you for sharing. Luci’s Morsels | fashion. food. frivolity. 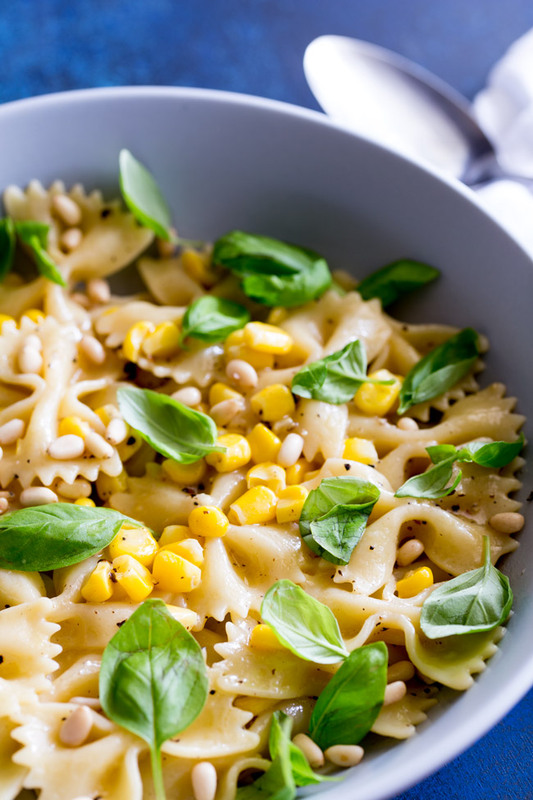 I love everything about this pasta: pasta, corn, basil, butter… I mean, really, what’s not to love!? I’m so excited to be seeing corn in the grocery store again – hooray for summer! I love summer flavors so much. 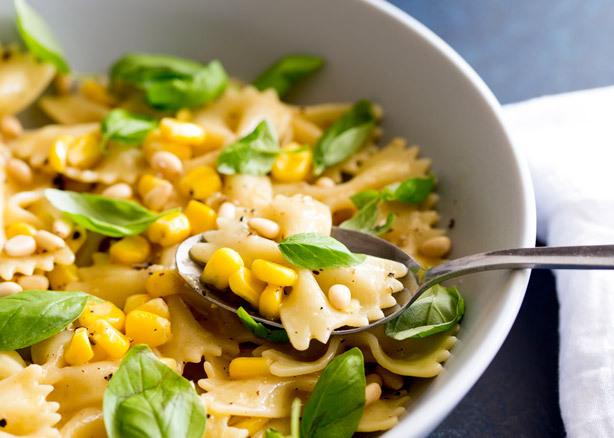 Oh, I love pasta and corn combination! Great idea!